The Easter Bunny left Seth some little bottles of glitter. You might be thinking that three is a little young to be introducing glitter, and your probably right. My thinking here was a) those little bottles of glitter glue are expensive for how long they last and b) I wanted to expose him to yet another art material. It seemed like a great alternative. In the end I think glitter glue requires less constant supervision and creates less of a mess, but I won’t be buying anymore of either for another year. We’ll just use up what we have. Seth’s thoughts? It was fun to squeeze the glue out. 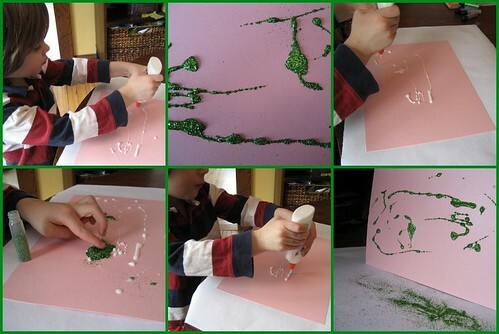 Pouring the glitter on was ok but he prefers glitter glue. However, he did really like the end result which is much more shimmery than glitter glue. Oh! And I will get back to you with the pizza recipe soon! yay, glitter! so much fun. but my mom told me when i was a kid not to get any in my eye, because it was glass and would scratch my eyeball. that really stuck with me… even today when i play with glitter i am hyper conscious about putting my hands anywhere near my eyes. thanks for the glitter complex, mom!